3 out of 5	Suggestion, would you consider creating a wig that looks like the picture? I love how well made this is and how natural looking it is, considering that this is synthetic. However I think that the picture displayed for this wig should not be used, because it’s extremely deceiving on its true colours. And I don’t think that that’s fair on customers. 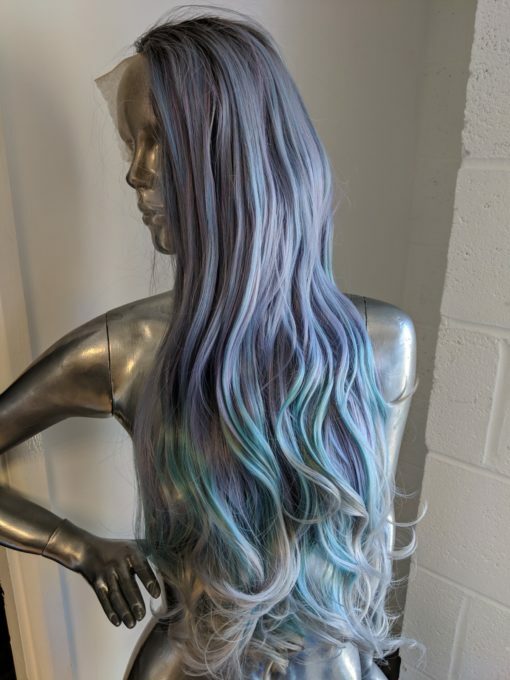 I do love this wig, but the hole thing of getting the wig in the first place was that it looked so blue and vibrant, when in fact, it’s not. So I would have probably went for a different wig instead. overall, love it, keeping it nevertheless. Hey. Its certainly never our intention to deceive. Eek, thats not how we roll. We have found the wig has been hard to capture by the models. We added some details to the description and further added some other photos. We strongly feel the wig looks even better in real life. I’m VERY disappointed in this product. There’s so much hair that it looks very stupid when you put it on, making it extremely clear and visible for the eye to see that it’s a wig. Makes your head look double the size it actually is. The wig is very heavy, it keeps falling off, sliding down (even if I was wearing the hair net). The tighteners are very poor as well, they keep popping open. The colors are very plain/greyish. I was expecting to get bluish-colored wig, but I got a weird light-purple horror instead. Sorry you were disappointed with your purchase. Jupiter is a very full, luxurious wig, it sounds like this wasn’t right for you – we feel the word “horror” is a little harsh, this is a gorgeous wig. I can’t see that you’ve contacted our customer service team with a complaint, you’re welcome to email us at shop@lushwigs.com if you’d like to discuss this further.